"According Poggio" is a private historic villa built in 1700 and Entirely renovated in 2012 in full respect of Its History, original design and materials. It is a short drive away from Florence (25Km distance), located on the hills of the Tuscan countryside. The villa comes with a private 40. 000sqm olive tree garden and a state-of-the-art swimming pool to relax. Kitchen: 4 ring-stove (gas), oven (electric), dishwasher, microwave. Absolutely wonderful house and location! This is an exceptionally nice house, beautifully furnished and with everything you could possibly need. The kitchen is really well equipped and the welcome basket was an especially nice touch! And what a lovely outside area with a fantastic pool, many comfortable seats, a beautiful view, and surrounded by olive groves (although the mosquitos are a little troublesome, so it's a good idea to take a spray). Thank you Marco for a wonderful holiday in your beautiful home! Perfect, magical villa with a great pool. We spent a week here and didn't want to leave! The villa is beautifully appointed with every care taken to detail. The rooms are large and tastefully decorated with amazing views across the hills and to the village of Pelago. The kitchen is well equipped and the bathrooms are lovely. The village of Pelago is a 4-5 minute walk up a path at the rear of the house where there is a small supermarket, a couple of bars/ cafes and a cashpoint. It has a pretty square leading up to the church. The villa's garden is wonderful with a choice of places to sit. The large, comfy outdoor sofa under the gazebo was my personal favourite. This was especially nice in the evening with the garden/pool lights on looking over to the lights of the village. One evening a deer walked past only about 10' away from me. All communication with Marco was excellent and we were greeted and shown around by Lucia, the housekeeper, on arrival. We only ventured out twice - a short drive to Fiesole with amazing views over Florence and some interesting Roman ruins, and a trip to Florence itself. We took the train from S. Ellero for convenience and it was a lovely 30 minute trip into Florence. Once at the station it's only a 10 min walk into the main historical centre. All together a fabulous place to stay - thank you Marco and Adele. We are always sceptical when renting a home as I think most people are, is it as described, are the pictures deceiving, well I can say with confidence that this home was above and beyond our expectations! We booked months in advance and the communication from the owner Marco was absolutely fantastic, upon arrival we were met by the Housekeeper and her family who took the time to show us absolutely everything we needed to know about the villa. The property is absolutely beautiful and no detail was missed we had everything needed to enjoy a very peaceful and relaxing vacation. Just everything about this villa, the location, the amenities, is just perfect, we will be back and I would not hesitate to recommend Marco's home to friends and family. Experience this Tuscan Gem for yourself! Nous venons de passer deux semaines en famille dans cette villa où tout contribue à la détente et au repos. La maison est fonctionnelle, elle dispose d'un équipement très complet et est décorée avec raffinement. L'hospitalité , le caractère attentionné de nos hôtes Marco et Adèle et la réactivité, dont ils ont fait preuve pour répondre à nos demandes ont largement contribué à la qualité de nos vacances. Je ne saurai terminé cette appréciation sans évoquer la beauté de la campagne environnante, composée d'oliviers centenaires et d'essences méditerranéennes. En conclusion, nous avons passé d'excellentes vacances à Pelago et recommandons vivement cette villa. 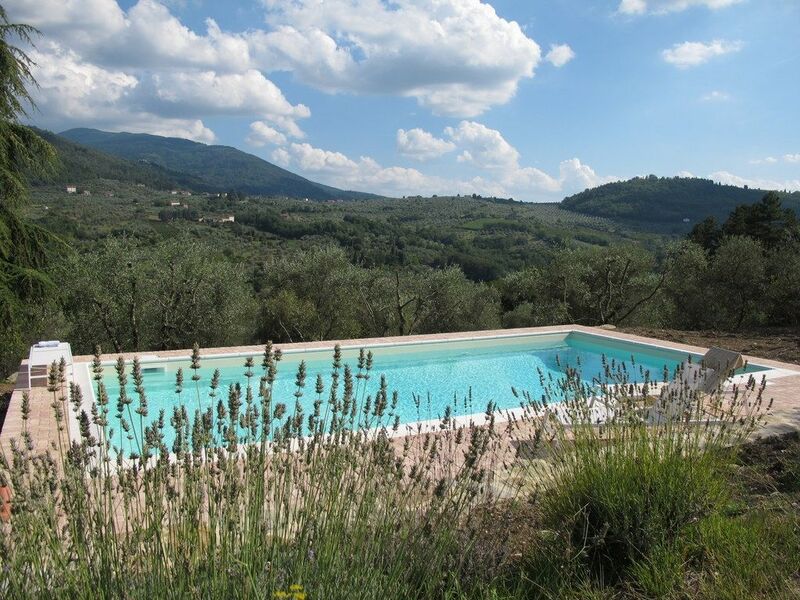 Incredible House in the Tuscany, luxuriously equipped, great pool. Very kind and attentive owner. We spent one week in the house with 6 adults and we had an incredible wonderful week. The house, the garden, pool and equipment were really fulfilling and met more than expected our wishes for one relaxing week in Tuscany. ..... we are definetely be back in 2018!!!! Florence is 25 Km from the house and can be easily Reached by car or by bus (bus timetable: www. Amvbus. It / times / 343. Pdf) anche or by train from the Train Station of Pontassieve Which is a village 5 km from the house (train timetable: www. Viaggiatreno. it). You will enjoy to take a walk in the center of the city; and if you wish to visit famous museums: such as the Uffizi (http: // www. gallery-Uffizi. en /) it is Advisable to book in advance. Wine tasting is a must here: in the nearby Castle Nipozzano (www. Frescobaldi. / En-us / home / letenute / castellodinipozzano. Aspx) you can taste the great wines of Frescobaldi and visit the castle. There are plenty of restaurants in the area; Bottega di Rosano (www. bottegaarosano. it) is a restaurant that you must try to experience the real local cuisine. Very close to the house there is Boccon Divino (www. Boccondivinofirenze. Com) specialized in seafood; the owner Claudio is excellent in organizing catering service at your house for parties and family lunches / dinners. The hills around Pelago are perfect for bycicle riding or walking. In the house you will find a map with several routes for trekking in the area of ​​Pelago. Florence is 30min drive from the house and will offer a wide variety of shopping opportunities. And just 15 Km from home you will find The Mall (www. Themall. It) Which is the temple of fashion shopping with the most famous brands at discount prices.